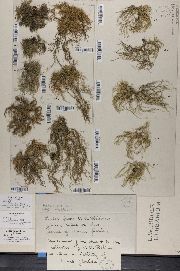 Thallus: erect-shrubby, 2 to 10 cm long, stiff and shiny branching: anisotomic- to isotomic-dichotomous, divergent basal part: concolorous with the branches, frequently red-brown pigmented at the very base, rarely partially black branches: tapered, cylindrical; lateral branches: not narrowed at attachment point; foveoles and transversal furrows: absent segments: terete, cylindrical papillae: absent to abundant, mainly verrucose tubercles: present fibrils: absent to numerous, short (2-3 mm) to long (5-10 mm), irregularly distributed soralia: punctiform to half width of branch bearing them, arising from cortex and/or tops of tubercles, plane to convex or capitate, rarely slightly concave, ±circular to irregular, transversally or longitudinally oblong, discrete or fusing together isidiomorphs: nearly absent to abundant, on young and mature soralia pseudocyphellae: inconspicuous, ellispoid to linear cortex: thick (11-17%), vitreous, smooth and hard, occasionally with longitudinal cracks, seldom red-spotted medulla: thin, compact, not pigmented axis: thick, not pigmented Apothecia: not seen Spot tests: K-, C-, KC-, P+ yellow turning reddish orange or K-, C-, KC-, P- Secondary metabolites: protocetraric acid (major), ±fumarprotocetraric acid (minor), or rarely none detected. Substrate and ecology: on bark (Quercus spp., Pinus spp. 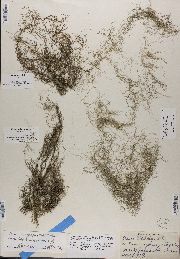 and on shrubs in coastal shrubs communities), rarely on rock, between 0 and 300 m World distribution: southwestern Europe, Macaronesia, eastern and western North America, South America Sonoran distribution: coastal southern California, including the Channel Islands, and Baja California, and the Sierra Madre Occidental of Sinaloa. 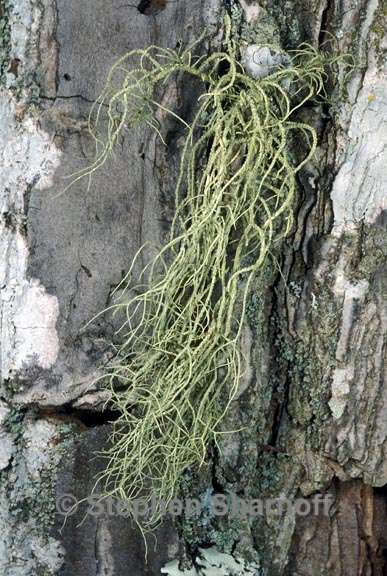 Notes: Usnea subscabrosa is characterized by a thick, hard, and vitreous cortex, a compact medulla, a basal part that is frequently red pigmented, cylindrical branch segments, minute soralia and the presence of protocetraric acid in the medulla. Usnea hesperina differs by having a dull and soft cortex and U. ceratina by having stipitate soralia, a pink pigment in the medulla and a different chemistry.